Penguin Publishing (thanks Yen!) 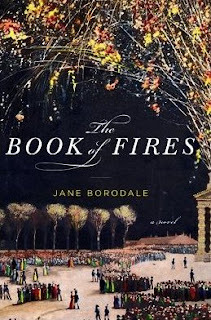 has graciously offered up 2 copies of The Book of Fires by Jane Borodale in celebration of the release on January 21, 2010. This giveaway is open to US entries ONLY and ends on January 21st. All you need to do is leave a comment with your email...yep....it's that easy! Sounds like a great book to me! I would LOVE to read this one! It looks fascinating. Please enter me in the drawing. Sounds like a gread read. Please enter me. Sounds super! Please count me in! Sounds fascinating! Please enter my name for a chance at a copy! What a fabulous trailer! This books sounds great! I would love to read this book. Historical fiction is one of my favorites and it fits right in that category. Thanks for hosting this giveaway. Well since you are making it so easy, how can I resist. This is on my TBR/wishlist. Please count me in!! Thank you for hosting this giveaway. I'd love to read this! Thanks for the chance to win a copy, Amy! Ooooh, how fun. This has certainly not been done before. This looks really good. Sign me up! This sounds fascinating! Loved the trailer! Please include me in your giveaway :) If I win, I'll have it shipped to a friend's addy in the US! Oh this book sounds so amazing! It kind of reminds me another book, The Firemaster's Mistress. Enter me in the contest please! This sounds like a very interesting read. Really enjoyed the trailer. This book sounds great. I'm game for anything 18th century. Sign me up! This is the first that I have read about this book --- but it looks quite enticing. I would LOVE LOVE LOVE LOVE to win this....this is exactly the type of thing I study. Good luck to everyone. I'd love to enter for this one. Thanks for the giveaway. I read someone's review of this book last year and wanted to read it. Thanks. This is the second or third blog I've encountered recently about this novel. And, the more I hear about it, the more I want to read it. Thanks for the giveaway. Everyone's commenting on how easy it is to enter-- maybe you should hold an arm-wrestling competition for your give-aways? I'm so glad that you said that it is reminiscent of Year of Wonders, because that is one of my all time favorite books! (I am hoping to visit the village of Eyam in April when I go over for our trip to England). Thanks for the drawing! Please enter me. I would like to read this. I have heard really good things abut it. Please enter me in your giveaway. This one looks good. Please sign me up! Please enter me. I loved Year of Wonders, so I should like this one too. Sounds like an intersting read. Thanks for the chance! Amy, this book looks SOOO GOOD! It sounds great to begin with, but comparing it to Year of Wonders (which I loved) is too too exciting! Please enter me in the contest!!! Thanks much!!! I've been really eager to read this since I first saw it was coming out. Thank you - this sounds amazing! Small chance encounters, luck, a strong sense of morality and an unusual profession in a moment in history. Very nice book video. This sounds like it will be an interesting step back in time. The History of fireworks alone is interesting. It sounds like an book that captures the atmosphere of the time. I look forward to reading it. The book sounds rather intriguing and one I think I would enjoy. Thank you for the chance. I can't wait to read this book, please enter me. Looks interesting! Would love to be entered in this giveaway. This one sounds very interesting. Love to have it!! This one sounds intriguing! I'd love to enter the contest! This would get me out of the 15 & 16 centuries for a while. I'd love to read it. This sounds so good and a bit different. Thanks for the giveaway. BTW, I love your new layout! Sounds unique. Sign me up! This looks good! Thank you for the chance to win it! I'd love a chance! Thanks for the giveaway. Sounds like a fascinating story! Please count me in. Thank you! This book is on my wishlist and I have requested that my library buy it but I would love to own a copy. Please enter me. I'm really interested in reading this book. Please enter me in the giveaway. Another great historical fiction book. Please enter me in this giveaway. Thanks. This looks like a really good read, please enter me for your giveaway. I'm a new follower. Sounds interesting, please count me in! Thanks. Sounds great. Thanks for the possibility. Looks good - please count me in! I really enjoyed the book trailer and the book itself sounds AMAZING!I really hope I win this one.